Chop the cucumber in a food processor or shred. About 1/4-1/2 cup. Wrap in a towel and squeeze to remove as much water as possible. Mix together the yogurt, shredded cucumber, garlic, white wine vinegar, salt and pepper to taste, and lemon juice. Drizzle lightly with olive oil. Refrigerate for at least 30 minutes before serving so the flavors can meld. 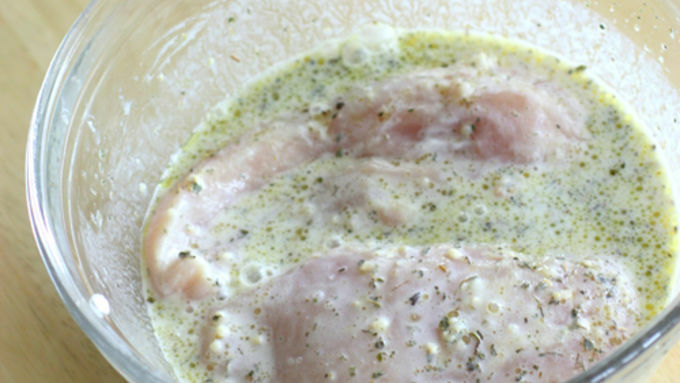 To prepare the chicken marinade, combine the garlic, lemon juice, red wine vinegar, olive oil, yogurt, oregano, and salt and pepper to taste in a medium bowl. Whisk together until mixed well. Add the chicken pieces to the bowl and mix well to coat. Cover and refrigerate for at least 30 minutes. The flavors will infuse the chicken the longer it marinates. Discard marinade after use. Cook chicken in a skillet on medium heat for 5-7 minutes or until done. Once the chicken is cooked, tranfer to a plate and let rest for 5 minutes. Cut into small strips. Warm pitas in the microwave. Top with chicken, tzatziki sauce, diced tomatoes and onions. Serve immediately. Homemade Greek food is easier than you think. 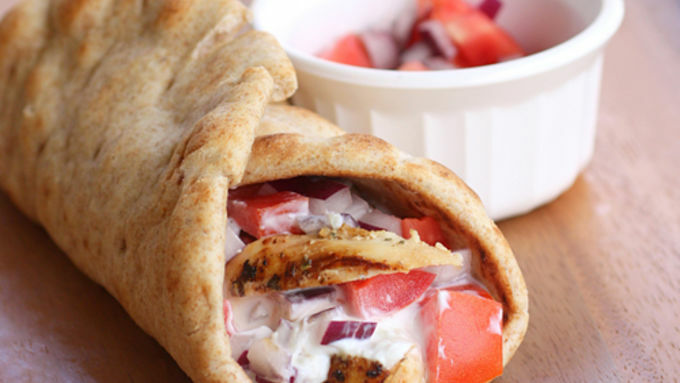 Whip up these tasty Chicken Gyros for an easy weeknight meal. 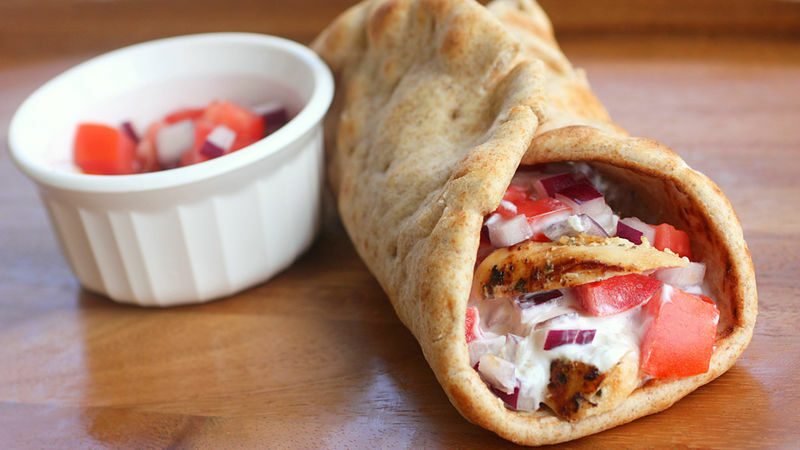 These Chicken Gyros start with warm pitas stuffed with Greek marinated chicken and are topped with cool and creamy tzatziki sauce (try saying that 3 times fast). Now if you really want to get your Greek on, you have to be able to say Gyro correctly. Gyro is pronounced “Yee-Roh” not “Jy-Roh”. Tip: This is a great meal to prepare the night before. The longer the chicken marinates and the tzatziki sauce sits, the more the flavors are infused. 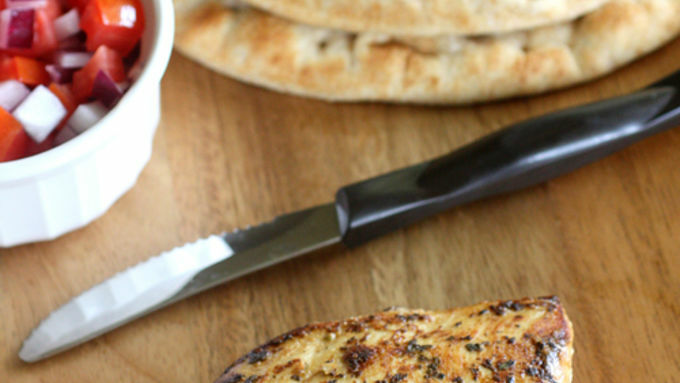 Slice up the chicken and place it on a warm pita. Generously top it with tzatziki sauce, tomatoes, and onions. Roll it up and enjoy. Opa!